Babylonian amora of the fifth generation; died in 410 (Samson of Chinon, "Sefer Keritut," p. 26a, Cremona, 1558). He was the pupil of Raba (Ḳid. 32b), who seems to have been his principal teacher, and who sometimes praised him (Hor. 10b), but occasionally blamed him (Ket. 85a; Giṭ. 73a). He appears to have been the pupil of Abaye also (R. H. 24b). His principal companion was R. Papa, from whom he was inseparable, both in and out of school ('Er. 12a; Ber. 58b; et al.). When R. Papa became head of the school of Naresh ( ), Huna was appointed president of the general assembly ("resh kallah") in the same school (Ber. 57a). As senior pupils, Huna and R. Papa took part in the halakic deliberations of their teachers. Their halakot are often mentioned in the Babylonian Talmud, and, according to Moses of Coucy ("Sefer Miẓwot Gadol," i., No. 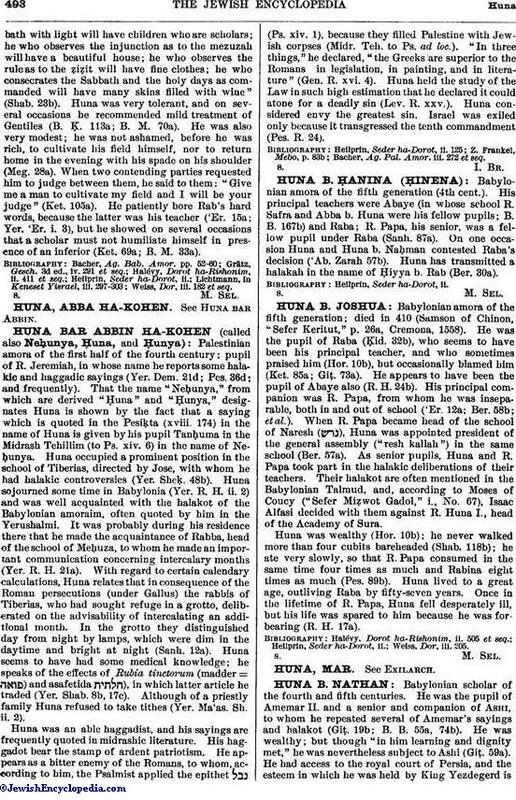 67), Isaac Alfasi decided with them against R. Huna I., head of the Academy of Sura. Huna was wealthy (Hor. 10b); he never walked more than four cubits bareheaded (Shab. 118b); he ate very slowly, so that R. Papa consumed in the same time four times as much and Rabina eight times as much (Pes. 89b). Huna lived to a great age, outliving Raba by fifty-seven years. Once in the lifetime of R. Papa, Huna fell desperately ill, but his life was spared to him because he was forbearing (R. H. 17a).